Having bought soft pastels to use with water colour (a demo by Cherry Nichol) I had the urge to play, using a technique I had seen done by Heather Selby. I used soft pastels on water colour paper, later discovering that you should actually use hard pastels first then the soft on top! I also had problems with the lighter colours becoming muddy but later discovered that you should use fixative on the dark colours before going into the light! But this is how we learn! Next time I will know what to do! I don't normally copy out of magazines but as this was just an experiment, I did. I then used some grey home made paper, soaked it and covered the pastel portrait with the saturated hand made paper, pressing lightly to transfer a ghost image onto the wet paper. Well it didn't work. The grey was not right. I didn't even bother to photograph it. After fixing the original pastel portrait I then used a sheet of white watercolour paper and soaked that. I covered the pastel and gently pressed down and this is the result! You are enjoying your experimenting (the Cherry Nichol influence?) and I'm glad you're back blogging. 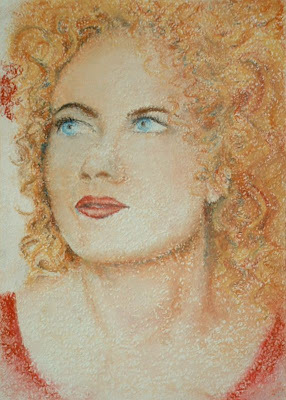 I love this portrait - your pastel work is fantastic. I love this portrait too, love the curls. I think it is great to experiment with new techniques and mediums. Wetting the paper and then stamping on the image is a cool idea too. I admire you for experimenting with different media. I'm still trying to perfect my watercolors. Keep up with the pastels. You are very proficient at portraiture. I like this portrait, I feel it is good to try magazine photos to experiment with different media, that way you don't get hung up on achieving a likeness. I like monoprints which is a similar technique to this one. Hi Carol, well done with this portrait! So glad you are experimenting with pastels, sorry I missed the Cherry Nichol demo. Wow... Carol... is there any medium that you don't use??? You seem to be multi, multi, multi talented. How fun for you AND for your viewers!! Liz thank you. I actually did this before the workshop! Made many mistakes though as it was a first timer. One learns all the time. Barbara, thank you. It took a lot of courage to push that wet paper onto the pastel! But then pastels are ralatively easy to repair! Thank you Jean! I still need to free up a bit more, like Liz has managed! Thanks Carolann. Monoprint being a single colour? or a print in single colour? Hi Di and thank you. It was an incredable demo. We are trying to get her to come to a SASA meeting later in the year. I am looking forward to visiting your blog again - found it fascinating! Hi Carol, Monoprint is simply a one-off printmaking technque with ink. Start off cover glass or perspex with ink using roller then carefully put your paper on top and draw your image, google monoprint or monotype for more details. Its fun to do. Hi Carolann. I think I must google it - sounds interesting although I really should not be trying any more new things!!! !